Viktor, a Steampunk Adventure is a cartoonish adventure-style point-and-click that follows our protagonist, Viktor the wild boar, on a quest to become the new Emperor of Austria-Hungary, following the loss of his job. The journey introduces us to friends and enemies, potential allies, and determined adversaries. Developed by Studio spektar, Viktor, a Steampunk Adventure does a remarkable job of blending exotic locations with comedy, psychological trauma, narcissism, and the unstable rantings of a megalomaniac mammal. After losing said job, Viktor is determined to change his fate and sets out to proclaim himself the undisputed ruler of his homeland. As they take on this quest, players visit eccentric versions of real locations -- such as Vienna, Krakow, and Budapest -- and encounter famous people from history like Nikola Tesla, H.G. Wells, and Franz Kafka. Oh, and Viktor undertakes these travels with his best friend, who happens to be a hookah-loving owl that proclaims himself psychic. The interface is simple, and clicking on an object or character presents a collection of standard point-and-click options -- talk, use, examine, and even attack -- though not every interaction is always available. I particularly enjoyed the ability to randomly attack various obstacles along Viktor’s journey, from simple wood stoves to other denizens of this silly world. As for the inventory system, it’s the standard drag-and-drop of the genre. One way Viktor, a Steampunk Adventure changes up the point-and-click recipe is to have Viktor's BFF, Marvin the Magnificent, literally on-call through the phone for clues whenever players get stuck. At times, a phone call to Marvin is required to trigger new dialogue choices for Viktor elsewhere in the world, which is an aspect that I would have preferred to do without. Still, it doesn't take long to adjust to this dynamic, and whenever progression seems delayed, a lively chat with our nocturnal avian seer often solves the trouble. The voice acting in Viktor, a Steampunk Adventure is unique: It consists of dialogue in gibberish, though the differences in pitch and tone as you navigate from one speaker to another are splendidly varied. This method lends well to the general atmosphere of this title, essentially an anything-goes kind of mayhem. Despite the chaos here, players can dig deeper and find a humorous, intriguing storyline underneath. Viktor, a Steampunk Adventure is ambitious, especially regarding mini-games. Although interactive puzzles are a common aspect of the point-and-click genre, few titles incorporate a legitimate mini-game, let alone numerous instances of them. Viktor takes the idea and runs with it, mixing up standard play by blending mini-games in seamlessly and frequently. Unfortunately, as much as I enjoyed the novelty of these experiences, I fiund the general mechanics of many of the mini-games themselves to be frustrating more often than they are fun. And although point-and-click titles are often a test of patience and detail orientation, adding a task in which the player must race an airship to acquire a needed ticket, for instance, feels a bit tedious. 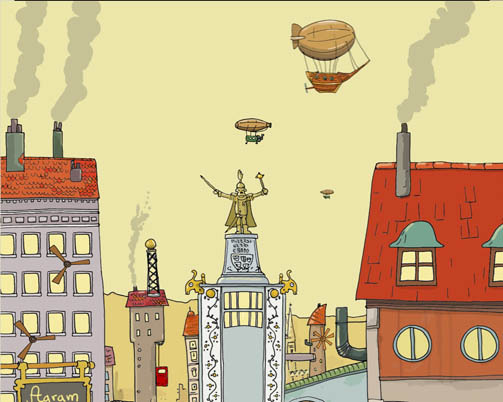 Where Viktor, a Steampunk Adventure does shine in the innovation department is in the comedy aspect, particularly in the dialogue and storyline. Beyond featuring a cast of characters composed of animals who give snarky commentary and have funny names -- I'm looking at you, Noam McSmelliecock -- the story twists and turns in ways that are surprising and quirky without dipping into the realm of infuriatingly obtuse puzzle solutions. The inclusion of multiple solutions for many of the puzzles was another superb gameplay choice, and it lends more replay value to Viktor than most point-and-click titles can muster. That said, I would argue that "steampunk" seems like a very loose interpretation of the genre and style found here, and the inclusion of minor things like airships and even a few robotic enemies doesn't quite dip into that aesthetic pool enough to make it a convincing element. I did, however, like the addition of an in-game music collecting system by way of finding records for the Gramophone, also a unique feature for this genre, and I savored the flexibility of changing my music score at will. The noble quest to become the new Emperor of Austria-Hungary -- by force, manipulation, or other unscrupulous means -- is a task that my chaos-loving heart can get behind. Viktor is a likable boar, and his silly methods for dealing with opponents, challenges, and career heartache are proof that he doesn't take himself too seriously. The cast of characters aiding or hindering his quest are witty and refreshing, and there’s an underlying chaotic aspect in the journey that I found to be a bold contrast to the usual fare of logic puzzles or absurd solutions found in other titles from this genre. 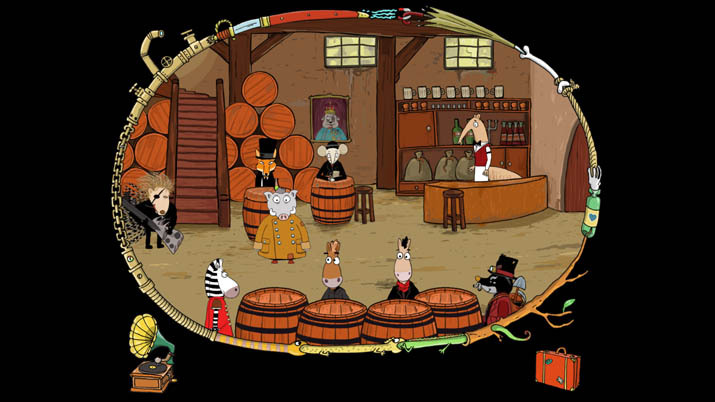 While not everything works, even in the narrative and setting, the cartoonish world of Viktor, a Steampunk Adventure shines, and the comedic-relief factor makes it an even more worthwhile addition to a point-and-click library. Although it's a relatively short journey -- roughly four to five hours, give or take a few mini-games -- the lasting quality of the humor and overall narrative make this title stand out in a sea of puzzle-laden adventure games.